Sometimes it takes a lot to get your webbed feet wet! An adorable picture book makes a splash with a satisfying story about conquering your fears. I cannot swim, and that is bad. A landlocked duck is very sad. One day, an egg rolled out of a nest and right into a deep pond. Now that egg is a little duck, and the water is still very scary. Jumping into the pond at all seems impossible, never mind swimming in a line with all his brothers. “You’re a duck, and ducks don’t sink,” Big Frog points out. Practicing in a puddle helps a little, while backrubs and snacks from his mother help a little more. Big Frog offers to hold his friend’s wing and dive in together, but our little duck knows that some challenges need to be faced alone. Even when they are very scary! Eve Bunting has written more than 250 beloved books for children, including Smoky Night, illustrated by David Diaz and winner of a Caldecott Medal, and Yard Sale, illustrated by Lauren Castillo. Eve Bunting lives in Pasadena, California. Will Hillenbrand has written and illustrated many books, including Bear in Love and Bear and Bunny, both written by Daniel Pinkwater. Will Hillenbrand lives in Cincinnati, Ohio. Bunting’s singsong rhymes don’t skip a beat as the duck’s trepidation turns into triumph. 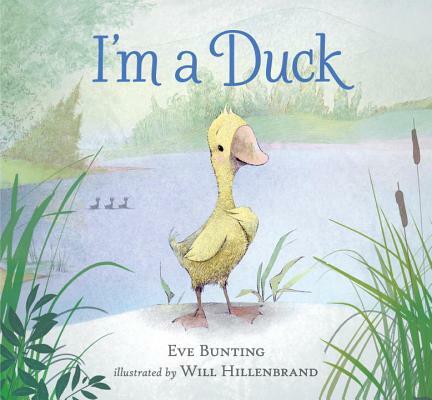 Hillenbrand is just as successful at capturing the duck’s growing confidence...It’s an endearing allegorical tale whose messages about practice and taking things at one’s own speed will buoy the spirits of children facing new challenges. Told with a storyteller’s flair, the unpretentious but precisely worded tale flows along steadily, easy to read aloud and pleasing in its expression of feelings familiar to young children. The delicate mixed-media illustrations, created with muted colors and understated patterns, perfectly capture the duckling’s fear, tentative attempts to overcome it, and final triumph. A beguiling picture book. This gentle tale about overcoming fear will comfort and encourage many a reluctant kid (or duck)...The duckling itself is reminiscent of Olivier Dunrea's Gossie and Gertie, with an innocent expression and oversized bill and an overall endearing look. This is definitely a "message" book, but any message in such effective hands will reach its intended audience where they are.